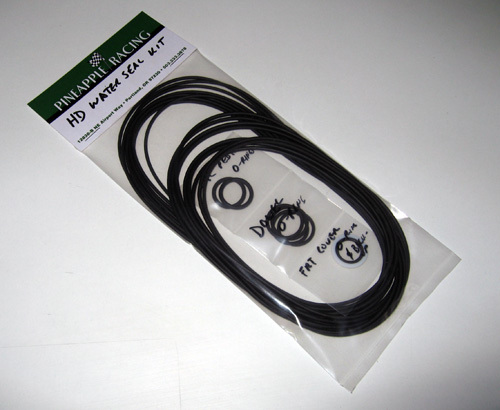 Home > Internal Engine Parts > Pineapple Racing HD Water Seal Kit - 12A/13B '74-'85 ONLY see internal engine parts category for other applications. This is our exclusive Heavy Duty Water Seal kit. We tested these seals for over 7 years in numerous street and track cars before offering them to our customers. They have proven to be a significant upgrade over the stock water seals. We use them in all our 5-year warranty motors. Also, these seals are re-usable if you need to reopen the motor to freshen it, as long as the mileage is not too high or the engine too overheated. In other words, if you make a mistake and blow up your engine or perhaps improperly clearance the seals or whatever, these seals can be removed, allowed to "rest" for about 30 minutes and be reused when you put the engine back together. Stock water seals must be disposed of when freshening an engine, even with just a couple heat cycles. Kit includes the water jacket o-rings, front cover o-ring (and backup washer, if needed), dowel o-rings, rear stationary gear o-ring and oil pedistal o-rings.